Updated Friday, Dec. 23, 2016, 1:30 p.m. EST: A Little Rock, Ark., police affidavit reveals that the man who allegedly fatally shot a 3-year-old boy in a road rage incident fired his gun because he thought a car was following him too closely, CBS News reports. Gary Eugene Holmes, 33, was taken into custody late Thursday and is being held on a preliminary charge of capital murder and two counts of committing a terroristic act in connection with the shooting death of 3-year-old Acen King. The affidavit says that Holmes' girlfriend, who is not identified in court filings, was in the car at the time of the shooting. The woman said that Holmes complained about a Dodge Charger following him too closely, so he pulled over and let the vehicle pass. It was then that he got out of his vehicle and fired his gun after the Charger had stopped at a sign for "a few minutes." That Charger was being driven by Acen's grandmother Kim King-Macon, and Acen, who was in the backseat, was shot in the neck, later dying in the hospital. A suspect was arrested in the shooting death of a 3-year-old Arkansas boy who was killed in an apparent road rage incident, THV11 reports. U.S. marshals confirmed that Gary Holmes was taken into custody for the killing of 3-year-old Acen King. 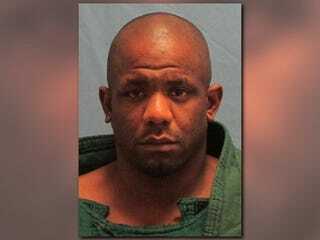 Marshals, assisting the Little Rock, Ark., police, worked with Holmes' family to convince him to surrender to authorities. Little Acen was killed last week while riding in his grandmother's car on a shopping trip. When the grandmother, identified as Kim King-Macon, stopped her vehicle at an intersection in Little Rock, the suspect pulled up behind her and started honking his horn, authorities said. King-Macon honked back, only to have the suspect step out of his black Chevy Impala and fire his weapon, officials said. Acen was hit in the neck. Neither King-Macon nor Acen's 1-year-old sibling, who was also in the vehicle at the time, was harmed. A $40,000 reward for information leading to an arrest and conviction was offered, with the city of Little Rock and the FBI contributing $20,000 each. Aden is the second child fatally shot in a car within the last month, and the 40th homicide of the year for the city. Read more at CBS News and THV11.